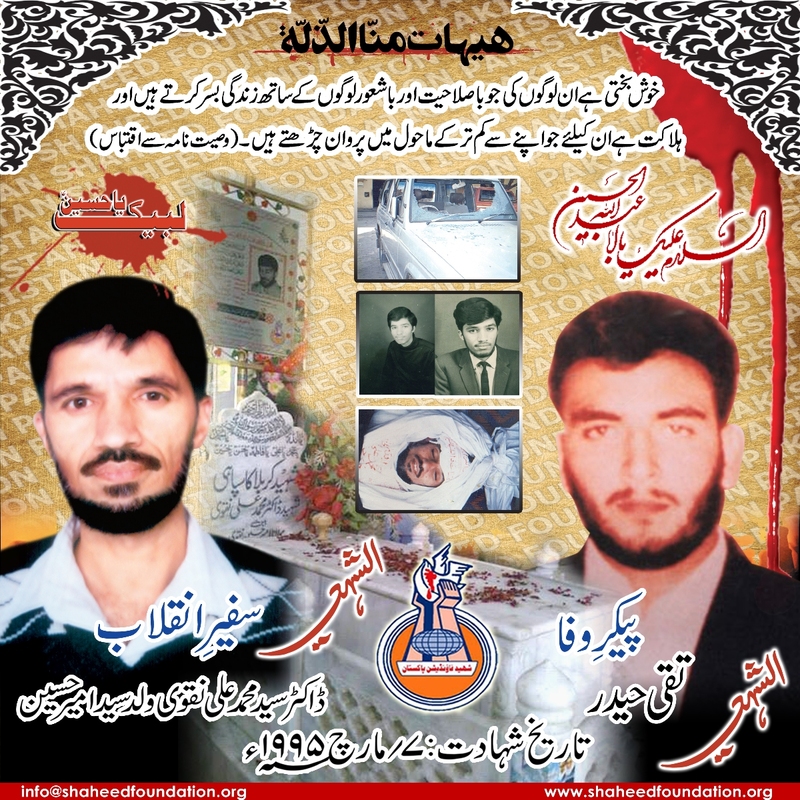 Shaheed Dr. Muhammad Ali Naqvi was born on 28 September 1952 at Ali Raza Abad, then in suburbs of Lahore. Besides his father, Maulana Syed Amir Hussain Naqvi, who made the conscious decision of leaving government service & proceeding for religious educatiion to Najaf, he was blessed to have Mohsin-eMillat Allama Syed Safdar Hussain Najafi as a paternal uncle. Dr. Naqvi's early years were spent in the pious atmosphere of Najaf and Karbala, perhaps a reason why he vehemently responded to "Hal min Nasirin ..." throughout his later life. He then lived in East Africa where his father was a preacher. He did his Senior Cambridge (O Levels) in 1969 from Kampala (Uganda). He was an exemplary scout and an excellent debater during his school days. He then came to Pakistan to do his F Sc. from Government College, Lahore. It was here that he founded the Young Shia Students Association. In 1972 he was admitted to King Edward Medical College, Lahore. He was again among the founder members of Tehrik-e Nifaz-e Fiqah-e Jafria under the leadership of Mufti Jaffer Hussain on 13 April 1979. Later, he remained the most loyal follower of Shaheed Quaid Arif al-Hussaini and carried forward his mission almost single-handedly after the Shahed Quaid left us on 5 August 1988. Dr. Naqvi's wish for matyrdom was accepted by Allah on 7 March 1995 when he, along with his loyal body guard Taqi Haider, were martyred in an ambush at Chowk Yateem Khan, Multan Road, Lahore. Let us resolve to repay the debt of his shahadat by trying to follow the path of this great martyr in service of Islam and Pakistan.